You probably know what my first 90-day challenge was, right? Publishing 90 videos in 90 consecutive days… A monumental feat that didn't create miraculous results right away. After publishing the 90th video I had a whopping total of 134 subscribers on YouTube. Today, a year and a half after finishing the 90-day content marketing challenge? But before I explain what that new challenge I've been working on is, I want to remind you of the real goals behind these content marketing challenges. The main goal is not the subscribers or traffic you're going to get from 90 days of activity. The main goal is about becoming a content creator and flexing the muscle enough times in a row, in a short enough period of time, that the process becomes easy. "I'm a behind the scenes guy… I'm not a content creator!" The process of creating my 90 videos and 90 days destroyed that limiting belief and open me up to a whole new world that I'm literally addicted to, now. Also, it is important to remember that a 90-day challenge isn't a "one-time thing" that you do and you're done. Melanie has done two 90-day blogging challenges in the life of her business… Plus one email challenge. 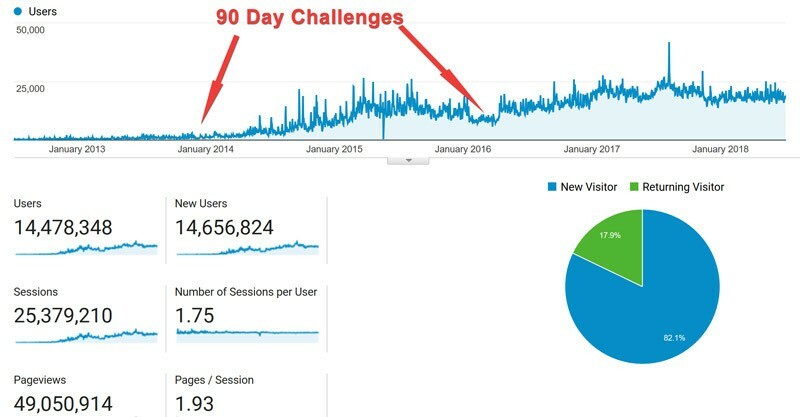 As you can see in the analytics screenshot below, each 90 day challenge had amazing and long lasting traffic results that launched her traffic to the next level! You've probably noticed that I'm still only publishing three videos per week so it's not a 90 day YouTube marketing challenge. This post you are reading today started off as an email to my list. More specifically it was email number 78 I've sent in 78 consecutive days. Right now, I'm less than two weeks away from completing my second 90-day challenge. This one being an email marketing challenge! You've probably heard me say in a video before "I'm not a great writer" or "I don't enjoy writing." Yet another limiting belief I've decided to destroy, once and for all! In the last 78 days of writing emails I've received more positive feedback on my written content that I've ever received in my life. The results? I am more confident and competent with the skill of writing than I've ever been before! And, the byproduct of all of this written content through daily emails has meant I have even more content to syndicate and repurpose in other areas! Several emails have made it onto my blog as posts… Like this one! Literally publishing the exact words I sent to you in an email, on my blog for the search engines! Because they still deserve to get picked up by the search engines and connect with more interested readers… And it's all about getting everything you can out of all you've got! I'm digging out the oldest emails that have the most value to publish their… So my "new posts" on Medium are actually emails that I wrote several months ago! So you can subscribe to my Medium blog and still get great value, even reading this email today… Because I'm not just posting this one thing in two places on the same day! And all of that writing activity has me so confident in my newly honed writing skills that I'm even hand-typing new blog posts from scratch that are absolutely epic! Three months ago, I wouldn't even had tried to write a blog post from scratch! The comments, the shares, the response to that post has been amazing! Okay, let's tie this up and bring it back to YOU! Because the ultimate goal here is to help you realize that the fastest way to get better at creating content and publishing online is to do it over, and over, and over again! If you want to get ripped, you gotta go to the gym every day and lift weights! You can't outsource your push-ups! You can, however, go from uncomfortable on video to creating epic videos that are in the top, most valuable videos in your niche! You can go from uncomfortable with blogging on WordPress to being a WordPress master and an SEO content and keyword samurai if you do it enough times in a short enough period of time. I have found no better way to create new habits, break down old limiting beliefs, and get momentum on your side as an Internet marketer and digital entrepreneur than doing a 90-day challenge! And if you've already done one… Guess what? It might be time for you to do your second 90 day challenge! I plan on putting out over 100 webinars, lots more eBooks, all geared to the standard easy niches, but then some that are based around being a car dealer, and PMP, and other ways I have helped Fortune 500 companies in the past make millions. Moving from employee to consultant, to business owner, and now enterprenuer, working and learning from those that know what they are doing, Looking forward to the next few months of what will come out from various ways of digital marketing I will do takes place. Will be interesting combining what I learn from you, daily working with Eben and his team, and having been involved with click funnels over recent years, but not currently part of what they do. Just sort of a conflict of interest with what I am helping Eben out with. But learned lots from Russell over recent years. Massive action is the path to success for sure!